The Celtic languages are a language family inside of the Indo-European languages. There are six Celtic languages still spoken in the world today, spoken in north-west Europe. They are divided into two groups, the Goidelic (or Gaelic) and the Brythonic (or British). 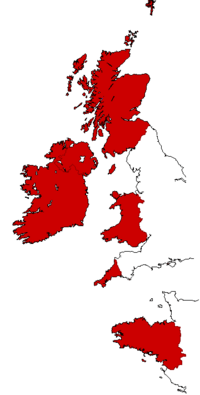 The three Brythonic languages are Welsh, Cornish, and Breton. Of these Cornish became extinct in the 18th century but people have started speaking it again now. Welsh is spoken everywhere throughout Wales, but is mainly the first language for people in the western part of Wales, in the area some people call the Bro Gymraeg. Breton is spoken mainly in west Brittany, and is the only Celtic language not mainly spoken in the British Isles. Because Brittany is part of France, the language is in danger of becoming extinct, just like Cornish, and there are ongoing efforts to prevent this from happening. The second of the four Botorrita plaques. The third plaque is the longest text discovered in any ancient Celtic language . Celtic languages Facts for Kids. Kiddle Encyclopedia.